Costa Atlantica is currently operating China sailings from Xiamen and Shenzhen throughout 2019. These sailings are catered to the Chinese market and are not available to book. Please check back later for news of Costa Atlantica’s 2020 deployment. 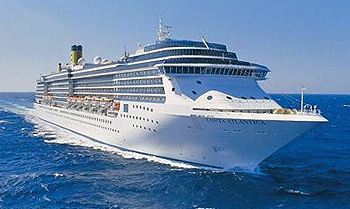 View more options for Costa cruises. With its 678 private balconies, Costa Atlantica was the first ship to be opened outwards, allowing cruises to be experienced in a completely new and fascinating way. Colourful, sunny, innovative but mindful of tradition, the ship pays tribute to the art of Federico Fellini and his “Dolce Vita”. Come join our staff aboard Costa’s Atlantica while we have a blast sailing the deep blue seas. Your time on-board will be completely occupied by our many activity and facility possibilities to enjoy at your leisure. Whether you decided to relax in the Jacuzzis, get dazzled up in the Beauty Salon or catch of some reading time in the Library. While you’re enjoying your cruises, our small cruisers are also accommodated with a Children’s Room for them to enjoy as well. If you’re looking for the finest cuisines and pastries on the big blue seas, Costa’s Atlantica would be the ideal ship for you. During your cruise you’re guarantee to have the ideal sailing experience ever. If you’re craving a wide variety of entrees, you’ll probably be interested in the Botticelli Buffet. If you’re interested in the fine restaurant scene you’ll find yourself inquiring about the Tiziano Restaurant. And for those who are crazy about the Cafe type atmosphere, the Caffe Florian would draw your attention. If your appetite shifts into 3rd gear around 3am, our 24-Hour Room Service will help you “calm the storm”. If entertainment is what you’re looking for, Entertainment is exactly what you’ll receive! The Atlantica is well equipped with a plethora of Lounges to suit every preference no matter how particular. If you’re in the mood for a little dancing, feel free to make your way to Dante’s Disco or to Club Atlantica to try out a couple dance steps. If you’re more into the Bar scene you’ll find interest in either the La Dolce Vita Bar/Atrium or the Aurora Pool Bar. 1,057 cabins in total, including: 660 with private balcony, 58 suites, all with private balcony. Milo Manara pays tribute to Italy’s most famous film director, Federico Fellini, with drawings inspired by his greatest works displayed on the ship’s 12 decks.